TAMILNADU – a land of rich Cultural Heritage. Given here are just few of the suggested Tamilnadu – India tour packages. We specialise in making customised itineraries and tour packages to Tamilnadu. Send in your preferences and your estimated cost enable us to provide your dream tour package. Travel to Tamil Nadu – Eden of tourism delight. The beautiful beaches, the magnificent temples, picturesque wildlife sanctuaries, colourful festivals and a plethora of panoramic sites make Tamil Nadu tourism an enthralling experience. Tamil Nadu is the magnificent land of temples and a paradise for all art-lovers. 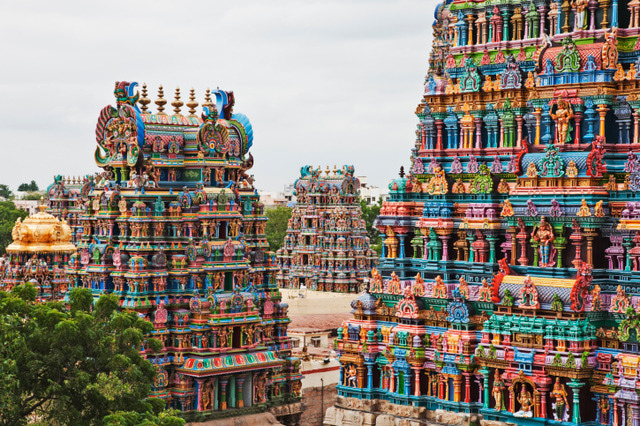 A blend of ancient and modern world, Tamil Nadu offers you myriad of breathtaking sights. Tour Tamil Nadu and relish its natural beauty. Tamil Nadu shares boundaries with three bedazzling state- Andhra Pradesh, Karnataka, and Kerala. On arrival, you will be met by our representative and transferred to the hotel. In the afternoon proceed for a half-day sightseeing of Chennai. Visit National Art Gallery, Fort Museum, San Thome Cathedral and drive past Marina Beach. Proceed for a day excursion to Tirupati. Visit Lord Venkateswara and Tiruchanoor temple. Drive to Mahabalipuram enroute visit Dakshina Chitra. Check-in to your resort. In the afternoon proceed for sightseeing of Shore temple – a worlds heritage monument, Five Rathas, Arjuna’s Penance, Tiger Cave. Rest of the evening free to relax on the beach. 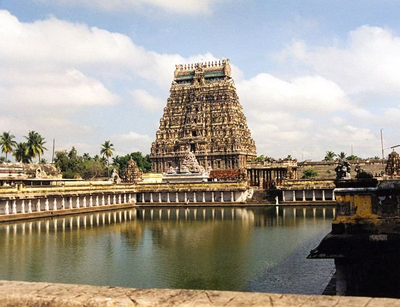 Drive to Kancheepuram one of India’s 7 sacred cities. Visit the temples Ekambareeswara, Vaikunta Perumal, Kamatchiamman, Kailasanathar temple. 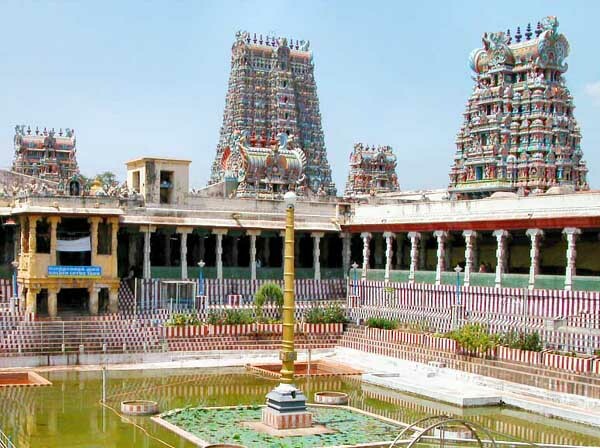 Later drive to Tiruvannamalai – visit the Arunachaleeswarar temple and the Ashram of Sri Ramana Maharshi who lived here and taught the virtues of philosophy through silence and meditation. Gingee has one of the most beautiful forts in the world built in the 14th century. It consists of three strongly fortified hills in close proximity to each other. There are many monuments, granaries and temples in these hills. Pondicherry was a French State in India and still retains French feeling. Visit Aurbindo Ashram, the city of dawn, which is 10kms north of Pondicherry. This ashram promotes Aurbindo’s ideas in bringing about a synthesis of Yoga and modern science, so as to unite the spirit and matter. After lunch at hotel, visit Auroville – a unique experiment in international living and in creating a new environment where men and women of all nationalities live together in harmony. In the evening relax on the beach which runs along the city. 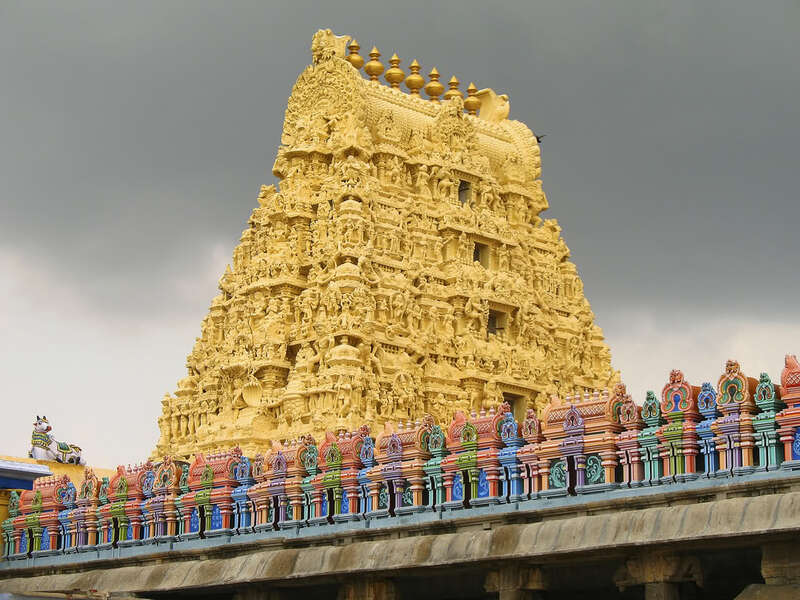 CHIDAMBARAM Visit the Natarja temple with golden gopuram. GANGAIKONDACHOLAPURAM The rock carvings here are bold with a keen sense of detailing and style. Seen in this rock carving is a huge temple elephant with the valiant guardians of the city. A huge Nandi, a dancing Ganesha and a lion headed well are other attractions. DARASURAM It is a fine testimony to the skill and craftsmanship of 12th Century Chola architects. It is covered with exquisite sculptures of Lord Siva in all his magnificence. He dazzles the viewer with his myriad poses besides enthralling the wives of sages. The temple front has fine columns interspersed with miniature sculptures. Tanjore is known for its architecture and Paintings. Visit Big temple, Museum and Bronze gallery. Drive to Madurai enroute visit Trichy Rockfort and Srirangam temple. In the afternoon visit Madurai Meenakshi Temple, Koodal Azhagar temple, Sound and Light show in the evening at 17th Century Nayak’s palace. After breakfast proceed to Rameshwaram- the most sacred temple town of India is an island hallowed by the epic Ramayana, where Lord Rama is said to have visited before going into battle of Srilanka. Legend has it that Lord Rama sent Hanuman to Mount Kailash to bring a Lingam for worship when he set foot after defeating Ravana. As Hanuman did not return when the auspicious hour was approaching, Sita made a sand Lingam so that worship could be performed in time, which is where the present day Ramanatha Swamy Temple stands close to sea on the eastern side of the island. One of the twelve Jyotirlingam shrines is also well known for its magnificent corridors and the massive sculptured pillars lining them. Lunch at local restaurant. Return to Madurai for dinner. After breakfast proceed for Kanyakumari – is the land’s end of India where the water of the Arabian Sea , the Bay of Bengal and the Indian Ocean meet. An important pilgrim centre of India , it is famous for the Amman Temples – a symbol of unity and sanctity – dedicated to the virgin Goddess , Kanya Kumari. To its South – East lies the famous Vivekananda Rock Memorial , a blend of all the architectural styles of India. Kanyakumari is famous for its spectacular sunsets and rises, especially on full moon days. The beach is a beautiful sight with multi-coloured sands. Morning witness the sunrise. Later proceed to visit the Musical pillars and huge 18 feet hanuman statue that are proof of the artistic skill of the time. this unique temple is dedicated to Trimurthy ( Brahma, Vishnu and Siva). Two chief attractions are the gigantic Hanuman statue and female Vinayaka (Vinayaki) relief carving. After a brief sightseeing of Trivandrum board the flight / train to onward destination.